-Black or charcoal grey in color. -Has traditional Mandalorian style double sleeves. -Black leather heavy cloth-like like vest. -Shoulders should flare outward like wings. -“Jango Style” vest is preferred. -Bottom of vest should end just after the bottom of the chest / back armor, and not be tucked into the girth belt, to allow for some flightsuit to show. -Black Neckseal may or may not be attached to the vest. -Consists of collar armor, left and right breast plates, a center diamond, and an abdominal plate. -Must be made of a solid material such as fiberglass, styrene or sintra. -Must have dimension and give the feeling of thickness and depth. -The collar, center diamond, left, and right chest pieces are red with light grey weathering. -The abdominal plate is painted light grey with red weathering. -The left breast plate must have two indented horizontal bars, painted to match the color scheme of the rest of the plate. -The center diamond plate between breast plates must have a raised vertical rectangle as shown in the visual reference. -All pieces must attach securely to the vest. -Shoulder armor should flare out off the shoulders to present a wider than normal silhouette. -Gauntlet color is charcoal grey. -Gauntlets taper towards the wrist. -Gauntlets have a seam on the inside of the arm with indents on either side of the seam as shown. -Gauntlets have a stepped detail on the top center as shown. -Left gauntlet has a Mandalorian compad attached on the top, near the wrist. -Black over the wrist gloves made of leather, nylon, or other low pile fabrics. Gloves must not show any labels or logos once the armor is on and cover any exposed skin. -Symmetrical, angled tombstone shaped handplates. -Color is charcoal grey, with red near the top. -Collar and backplate do not overlap. -Black or charcoal grey leather or leather-like material. -Either the same color or slightly lighter color than the flightsuit. -6″ to 8” tall depending on the height of the wearer. -Segmented belt worn outside of the girth belt. -Plate size/positioning must match the visual reference. -All belt segments are 3 inches tall. -Front center segment is 1.5 inches, with a 1 in x ½ in section removed from the center. -Moving out from the middle on either sides are as follows: ¼ inch, 1 inch, ½ inch. Then, 3 inch pieces are repeated until the wearer’s side. The two pieces on the wearer’s left and right hip are 3 inch pieces, with a 1 inch by 1 inch removed from the center. -Back half of the belt contain 3 pieces. There is a 3 inch segment in the center of the back, and the remaining length (from the right hip to the back center, and from the left hip to the back center) are solid pieces. -Triangular cod piece with rounded bottom edge. -Color is grey to match the helmet and armor. -Wraps around the outer thigh. -Holsters are integrated with the armor. -Must have no visible straps / attachment. -Must attach securely to the front of the knees over the flightsuit with no straps or visible means of attachment. -Color is grey to match the cod piece/gauntlets etc. -Black boots with black soles and toe covering. -Palladium boots Pampa Hi in black canvas are an example of acceptable style. -Boot armor covers the top of the foot, hiding laces if present. -Boot armor must connect with no visible means of attachment. -Paint scheme to match the visual reference. -Animated style pistols to fit in thigh holsters. -Painted in silver and gunmetal grey to match the visual references. -Facial hair should be a full beard. -Hair parted on the left, and styled like Obi-Wan. -Color to closely match visual reference. 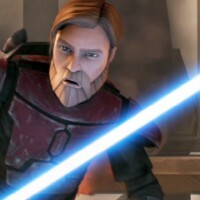 -Obi-Wan Epi 3 Saber with blue blade. -Hung from belt, or carried.